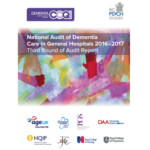 The National Audit of Dementia (NAD) (care in general hospitals) measures the performance of general hospitals against criteria relating to care delivery which are known to impact upon people with dementia while in hospital. The third audit collected data between April and November 2016. The National Audit of Dementia Criteria include policies and governance in the hospital that recognise and support the needs of people with dementia, elements of comprehensive assessment, involvement of carers, discharge planning, and identified changes to support needs during admission. The audit found that hospitals in England and Wales have made many positive changes aimed at making hospitals more “dementia-friendly”. Overall nearly 70% of carers rated care as excellent or very good, and 75% said that the person with dementia was definitely treated with respect by staff. Many more hospitals are providing dementia awareness training to all groups of staff, and 96% have a training framework for dementia care, up from 23% in the first round of audit in 2011. Nearly all hospitals (94%), have created dementia “champions” to lead change and support staff, following a recommendation made in Round 2. Staff however said they could not always access specialist support, especially out of hours. Nineteen percent of staff surveyed said that patients with dementia had nutritional needs met only some of the time, and five percent said their needs were not met. Three quarters of staff (73%) said they could obtain food 24/7 for their patients. Food outside of regular mealtimes is necessary for people with dementia as many patients forget to eat or only eat little and often, because dementia has disrupted their sense of routine. In the webinar below, Dr Oliver Corrado, Dr Beth Swanson and Chloe Hood from the National Audit team present the findings from the third audit. The Chief Executive Officer should ensure that there is a dementia champion available to support staff 24 hrs per day, 7 days per week. This could be achieved through ensuring that people in roles such as Site Nurse Practitioners and Bed Managers have expertise in dementia care. National Commissioners should propose a national programme aimed at embedding the collection, sharing and use of person centred information with a clear expectation this information will follow the patient between providers. Chief Executive Officers and commissioning services should make sure when tendering for new catering contracts that access to finger foods and snacks 24 hours a day is included. The Safeguarding Lead should ensure staff are trained in the Mental Capacity Act, including consent, appropriate use of best interests decision making, the use of Lasting Power of Attorney and Advance Decision Making. Training should cover supportive communication with family members/ carers on these topics. The Medical Director should ensure that hospitals have robust mechanisms in place for assessing delirium including appropriate assessment on admission and discharge with full recording of results.